A community centre has launched a drive to become Wolverhampton’s first Healthy Living Hub – offering local residents a wide range of health and wellbeing advice and services. The plan was unveiled during a fun day at Low Hill Community Centre on Saturday (18 August, 2018) and has come about thanks to a collaboration between Low Hill Community Association, local pharmacies, community volunteers and the Public Health Team at the City of Wolverhampton Council. It is based on the highly successful Healthy Living Pharmacy model already rolled out across Wolverhampton and will provide a one-stop shop for individuals and families who want to improve their health and wellbeing. 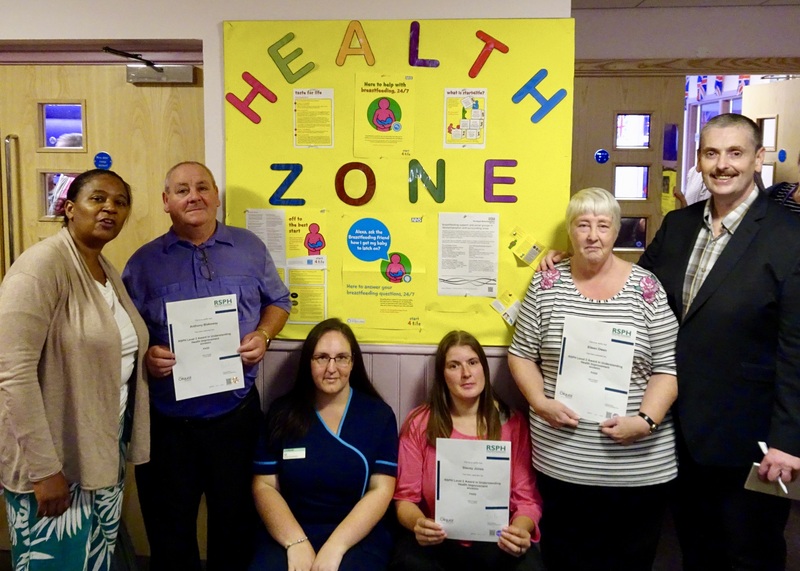 Members of Low Hill Community Association teamed up with volunteers from Low Hill Nursery to undertake accredited training through Adult Education Wolverhampton to become qualified health champions, and are on hand to help visitors make healthy choices and access services. They can show people how to access online support, for instance to help them stop smoking or reduce their alcohol consumption, and signpost them to information about local health and wellbeing services via the Wolverhampton Information Network website. The health champions can also refer people to appropriate health services such as their GP for an NHS Health Check or community pharmacy for advice on medication or minor ailments. The Healthy Living Hub has a dedicated health promotion zone, and has already hosted an event to celebrate breastfeeding, while the community centre itself offers a wide range of services, all of which support health and wellbeing in some way. These include an Easy Line gym, employability training, computer classes, health and fitness sessions, martial arts and activities for families and young people such as cooking sessions, art and crafts and dance and drama. The community centre is continuing to work towards Healthy Living Hub status, and hopes to achieve it by November, when it will also be celebrating its 80th birthday. Tony Blakeway, head of Low Hill Community Association, said: “Our motto is ‘by the community, for the community’, and we aim to become a central hub for all residents of Low Hill, the Scotlands, and Bushbury. Councillor Hazel Malcolm, the City of Wolverhampton Council’s Cabinet Member for Public Health and Wellbeing, said: “The Healthy Living Hub model enables communities to get involved and help bring about better health outcomes for local residents. As is the case with the Healthy Living Pharmacy scheme, community organisations wanting to achieve the Healthy Living Hub quality mark must meet a number of requirements, including having qualified health champions and a dedicated health promotion zone and running and supporting public health campaigns. Community organisations interested in finding out more about becoming a Healthy Living Hub are asked to contact Riva Eardley, Pharmacy Support Officer at the City of Wolverhampton Council, by emailing riva.eardley@wolverhampton.gov.uk or calling 01902 554208. Over 90% of pharmacies in Wolverhampton have secured Healthy Living Pharmacy status since the programme was launched last year, with health champions on hand to give out high quality information and support on a range of issues, including sexual health, stopping smoking and reducing alcohol intake. They can also provide health improvement advice to local businesses, schools and community groups, and proactively engage with members of the local community in health promotion.